Storey Publishing, LLC, 9781580175692, 384pp. It’s a whole new world of houseplants, so make yourself at home in it! If you love the idea of keeping houseplants, but struggle to care for them, you’ll find solace and invaluable advice in this comprehensive guide from expert gardener Barbara Pleasant. Even experienced houseplant enthusiasts will benefit from Pleasant’s expansive knowledge of indoor gardening, which includes personality profiles, growing needs, and troubleshooting tips for 160 blooming and foliage varieties. Create a greener world, one houseplant at a time. Barbara Pleasant has been covering organic gardening and self-sufficient living for more than 30 years. A contributing editor to Mother Earth News, Pleasant has garnered multiple awards from the Garden Writers Association and the American Nursery and Landscape Association. 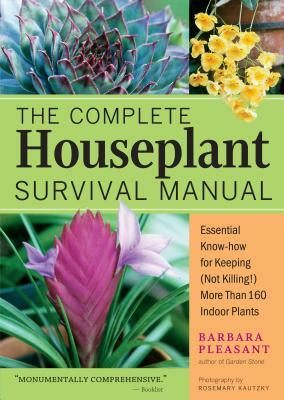 She has written books on topics ranging from compost to weeds, including Homegrown Pantry, Starter Vegetable Gardens, The Complete Compost Gardening Guide (with Deborah L. Martin), The Complete Houseplant Survival Manual, The Gardener’s Bug Book, The Gardener’s Weed Book, The Gardener’s Guide to Plant Diseases, and Garden Stone. Her columns and articles appear regularly in Mother Earth Living magazine and at GrowVeg.com and on other informational websites. Pleasant lives in Virginia, where she grows vegetables, herbs, and fruits along with a few chickens, who all have names.